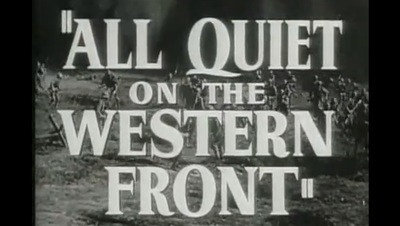 All Quiet on the Western Front is an American war movie. It stars Louis Wolheim, Lew Ayres, John Wray, Arnold Lucy, Ben Alexander, Scott Kolk, Owen Davis Jr., Walter Rogers, William Bakewell, Russell Gleason, Richard Alexander, Harold Goodwin, Slim Summerville, G. Pat Collins, and Beryl Mercer. What is Your Favourite Saturday Morning Cartoon? What is the best arcade game?